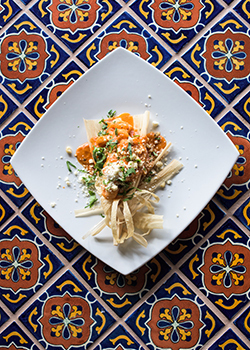 At Alamexo Mexican Kitchen, executive chef Matthew Lake makes tamales that are anything but routine. His tamales de elote, for example, translates simply into “corn tamales.” Elote is the Nahuatl term for corn on the cob. But although fresh, sweet corn kernels serve as the basis of Lake’s tamales—along with a little masa corn flour, minced white onion (“never yellow!”, he admonishes), jalapeño and dried, soaked corn husks for presentation—these tamales are extraordinary. 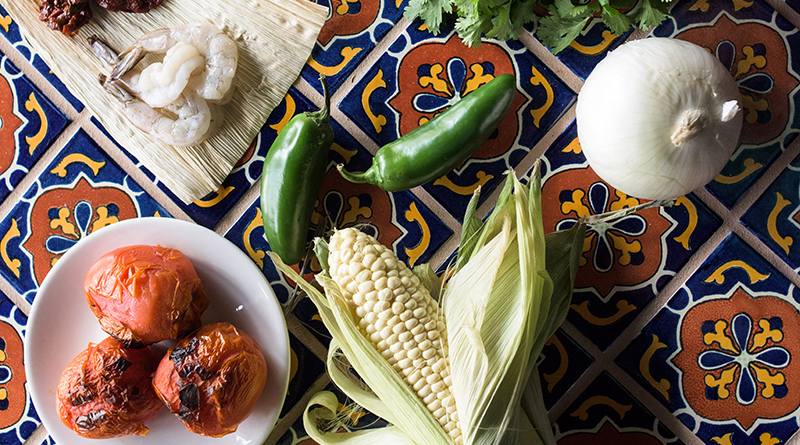 Fresh ingredients and classic Mexican cooking techniques are key. For the salsa chipotle con crema that accompanies the tamales, Lake roasts ripe plum tomatoes and garlic cloves on a comal, then purees them with heavy cream and chipotle adobo. Large shrimp are flash-seared and then finished in the simmering salsa. Lake tops the tamales with the shrimp and salsa and then garnishes with grated queso freso, minced white onion and fresh cilantro. Combining tradition and innovation, Matthew Lake and Alamexo have created one of the best Mexican restaurants north of the border. Just try the tamales, and you’ll agree.